Pyongyang : The Central Committee and the Central Military Commission of the Workers' Party of Korea gave a banquet in congratulation of the nuclear scientists and technicians who brought the great auspicious event in national history, a mega-event through the perfect success in the test of H-bomb. Kim Jong Un, Chairman of the Workers' Party of Korea, Chairman of the State Affairs Commission of the DPRK and Supreme Commander of the Korean People's Army, was present at the banquet. Present there on invitation were the contributors to the successful ICBM-ready H-bomb test. Kim Jong Un appeared at the banquet hall of the Mokran House and reviewed a guard of honor of the Ground, Naval and Air and Anti-Aircraft Forces of the Korean People's Army and the Worker-Peasant Red Guards together with those contributors. Ri Man Gon, vice-chairman of the WPK Central Committee, made a congratulatory speech. He warmly congratulated the brave heroes who made a great contribution to attaining the final goal of completing the state nuclear force set forth at the Seventh Congress of the Party by achieving the perfect success in the test of H-bomb upon the authorization of Kim Jong Un, commander-in-chief of the nuclear force of the Republic. He said that the nuclear death-defying corps members who plunged into the nuclear battle site and carried out the Party's order at any cost by unsparingly dedicating their youth, lives and family happiness without wanting any honour or praise are, indeed, the real patriots and unassuming persons of distinguished service to be respected by the whole country. One hardly knows the detailed struggle and merits of the nuclear developers, but our Party carefully considers their blood and sweat and heroic exploits deep in the ground and most highly praises them, the speaker said, and went on: There are not a few people engaged in the national defence in the world, but only our nuclear developers lead a worthy life with the greatest glory and happiness under the particular love and care of the leader. Our H-bomb with super explosive power is certainly the H-bomb of Kim Jong Un produced by his ardent love for the country and the people and the thermonuclear bomb of the Workers' Party of Korea. Our Party is designing the bright tomorrow of a socialist power in firm reliance on the defence scientists boundlessly faithful to the country and the revolution, the speaker said, stressing the need for the nuclear developers to fully equip themselves with the spirit of defending the Party Central Committee unto death, more dynamically conduct the campaign of the final stage for completing the state nuclear force and thus fill the arsenal of the Supreme Headquarters with the strongest nuclear warheads in the world capable of totally contain the enemy. At the banquet Kim Jong Un made significant remarks. He highly praised the nuclear developers for most proudly and realistically carrying out the sector tasks set forth at the Seventh Congress of the Workers' Party of Korea, and gave thanks once again to them on behalf of the Party and the state. He said earnestly that how glad Chairman Kim Jong Il must be when he knew the news of today's victory as he hewed out the road of building the nuclear force of the DPRK and led the work to victory. The recent test of the H-bomb is the great victory won by the Korean people at the cost of their blood while tightening their belts in the arduous period, he stressed. He called upon all the fields and units to follow the fighting spirit and trait of the nuclear combatants who are taking the lead in the drive for carrying out the decisions of the Seventh Congress of the Party. He put forward the tasks for the scientists and technicians in the field of defence science to conduct scientific researches for bolstering up the nuclear deterrence of self-defence in the drive to attain the final goal of completing the state nuclear force, true to the Party's line of simultaneously pushing forward the economic construction and the buildup of nuclear force. He said that the final victory of the Juche revolution is certain as there are firm self-supporting economic foundation provided by the great leaders, the large contingent of talented scientists, army and people having the revolutionary spirit of Paektu and their fighting tradition of self-reliance. He called upon the reliable nuclear combatants of the Party to win greater victory with redoubled efforts, not slackening the spirit displayed by them in bringing the great auspicious event in national history, a mega-event through the successful H-bomb test. 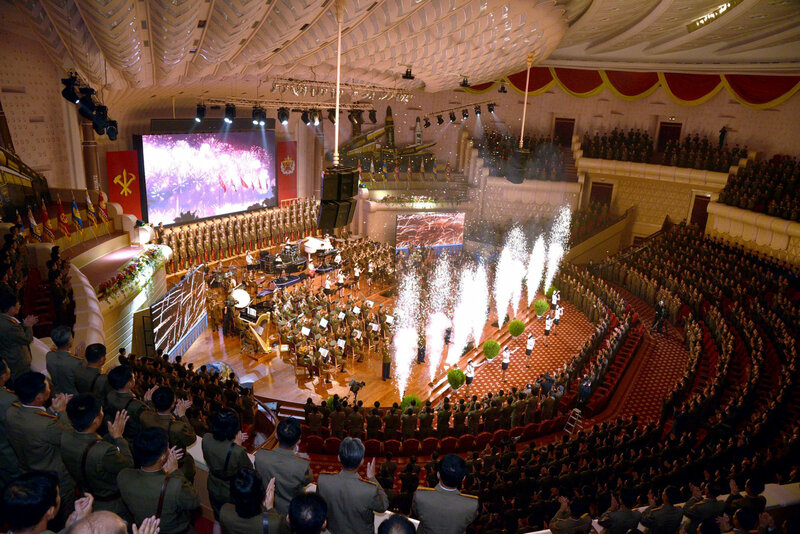 The banquet proceeded in an atmosphere overflowing with high revolutionary enthusiasm of the participants to firmly defend the Party and the revolution with the strongest nuclear bombs in the world by successfully concluding the research and development campaign of the final stage for completing the state nuclear force, upholding with loyalty the leadership of Kim Jong Un. Present at the banquet were Hwang Pyong So, Pak Pong Ju, Choe Ryong Hae and other senior officials of the Party, the state and the army.